Action Tile Help | Appracatappra, LLC. Action Tiles were designed to make adding it to your mobile application in Xamarin Studio easy. Add a UIView to your project in the main.storyboard file using Xcode then switch it’s type to ACTileController. The Tile Controller can either fill the app’s view or take up a portion. Open your Main.axml file in Visual Studio, insert a View into it, switch its Class to ActionComponents.ACTileController in the Source view. As with iOS above, the Tile Controller can either fill the app’s view or take up a portion. You also have the option of creating your Action Tile Controller completely in C# code for either iOS or Android. For Android, pass the current Resources and specify the ID of an image added t the project’s Resources/Drawable directory. "No remote links are currently active on this device. 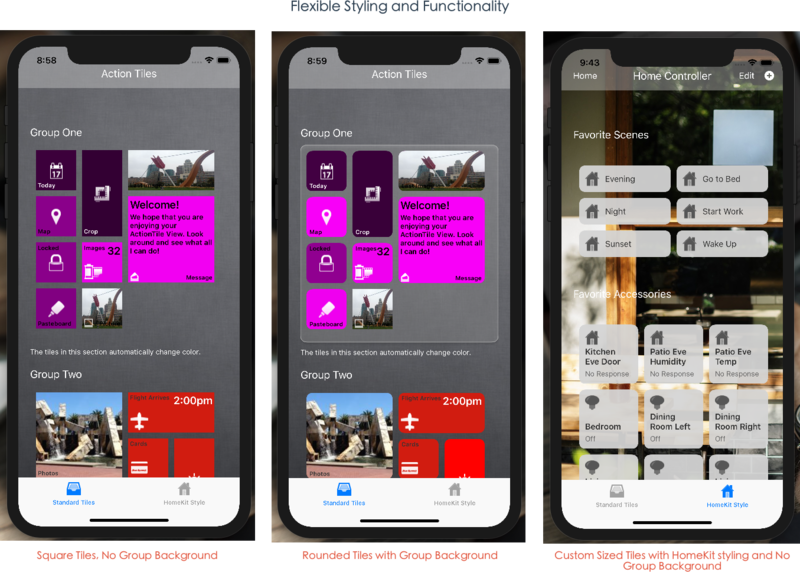 Tap tile to update..."
Action Tiles provides a suite of different tools for creating, grouping, managing and interacting with tiles in your iOS and Android apps. In addition to the Tile and Group appearances, the appearance of the Navigation Bar and the Tile Controller can be fully customized to fit the needs and styling of your app. liveUpdateAction – Gets or sets the ACTileLiveUpdate action that will be performed via an automatic update kicked off by the liveUpdateTimer in the parent ACTileController. title – The optional title of the tile. subtitle – The optional subtitle of the tile. description – The optional description of the tile. icon – The optional icon/image for the tile. appearance – The tile’s appearance such as font sizes and colors. style – The type of tile that will be displayed. group – The ACTileGroup that the tile belongs to. tileSize – The size of the tile. customRowHeight – Defines the number of rows a column occupies when the size is set to custom. customColumnHeight – Defines the number of columns a column occupies when the size is set to custom. 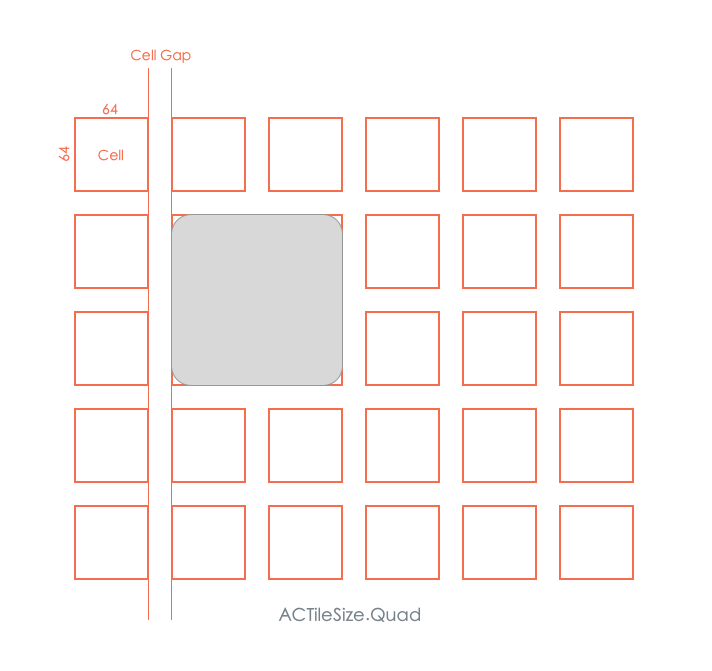 ACTiles are created by the AddTile method of the ACTileGroup. autoSetTextColor – If true the tile will automatically select all the text colors to contrast the tile’s background color. background – The tile’s background color. border – The tile’s border color. borderWidth – The width of the tile’s border. borderRadius – The radius of the tile’s rounded corners. roundTopLeftCorner – Rounds the tile’s top left corner. roundTopRightCorner – Rounds the tile’s top right corner. roundBottomLeftCorner – Rounds the tile’s bottom left corner. roundBottomRightCorner – Rounds the tile’s bottom right corner. isRoundRect – true if all corners are rounded. isRect – true if none of the corners are rounded. shadow – The tile’s shadow color. hasShadow – true if the tile display’s a shadow. titleColor – The title color for the tile. titleSize – The title font size. subtitleColor – The subtitle color for the tile. subtitleSize – The subtitle font size. titleBackground – The background color for the tile’s title. descriptionColor – The tile’s description color. descriptionSize – The description font size. Creates, maintains and controls a scrollable collection of ACTile object that can be organized into ACTileGroups. Provides routines to automatically “live update” the contents or styling of the tiles and routines to handle user interaction with the tile selection. groups – The collection of ACTileGroups that the controller maintains. liveUpdateRunning – true is a live update is currently being performed. 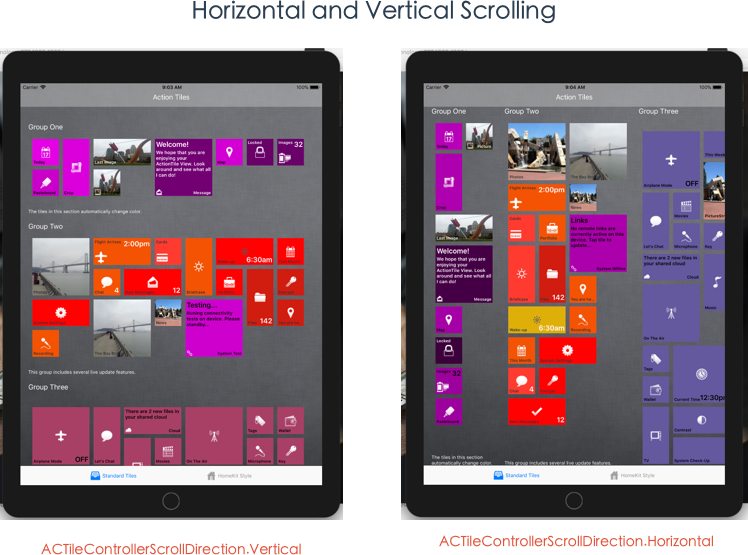 setScrollDirectionFromDeviceOrientation – If true the Tile Controller will attempt to set the scroll direction based on the devices orientation. suspendUpdates – If true all updates will be suspended until set to false. Set suspendUpdates to true when performing a large number of tile updates or additions to improve app performance. 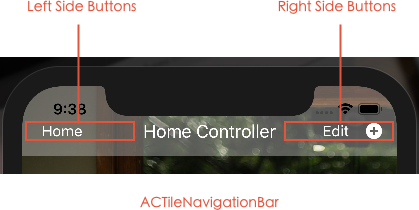 navigationBar – Provides access to the Tile Controller’s ACTileNavigationBar. liveUpdate – If true the Tile Controller will run any live updates attached to any given Tile, Group or the Controller itself. liveUpdateFrequency – Set the number of seconds between live updates. groupAppearance – Sets the default appearance for all Groups. tileAppearance – Sets the default appearance for all Tiles in all Groups. scrollDirection – Sets the scroll direction. appearance – Controls the appearance of the Tile Controller. scrollView – Provides access to the embedded scroll view. title – Sets the title for the Tile Controller. count – Returns the number of Groups being controlled by this Tile Controller. 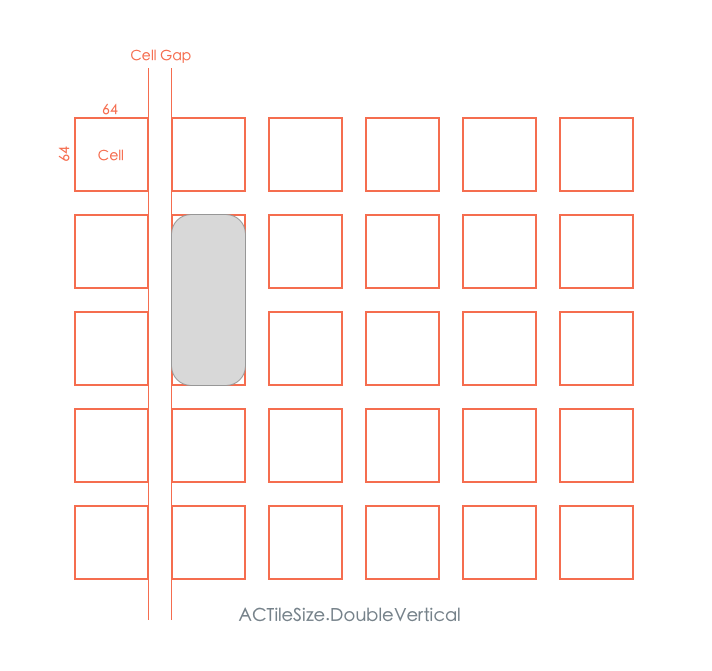 cellSize – Defines the size of each cell in pixels. 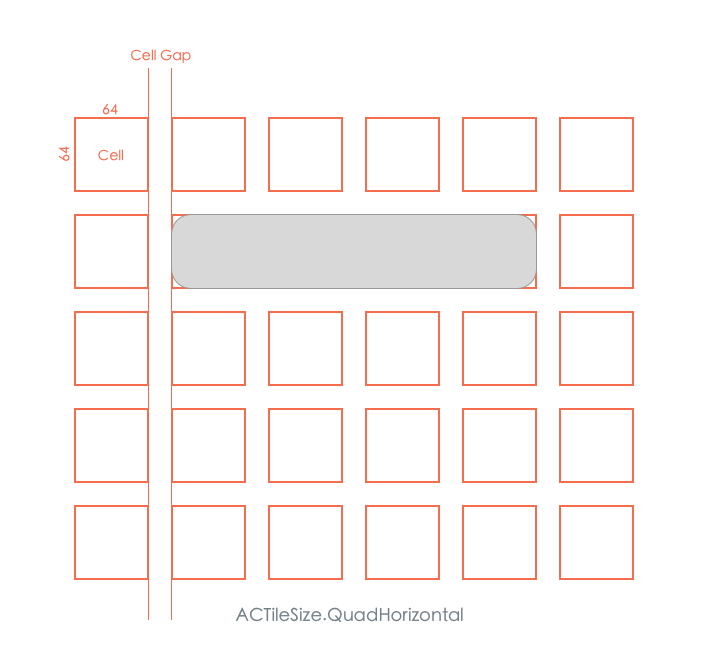 Even though tiles can be all different shapes and sizes, the default unit of measure is a square cell of which all tile sizes are then calculated. 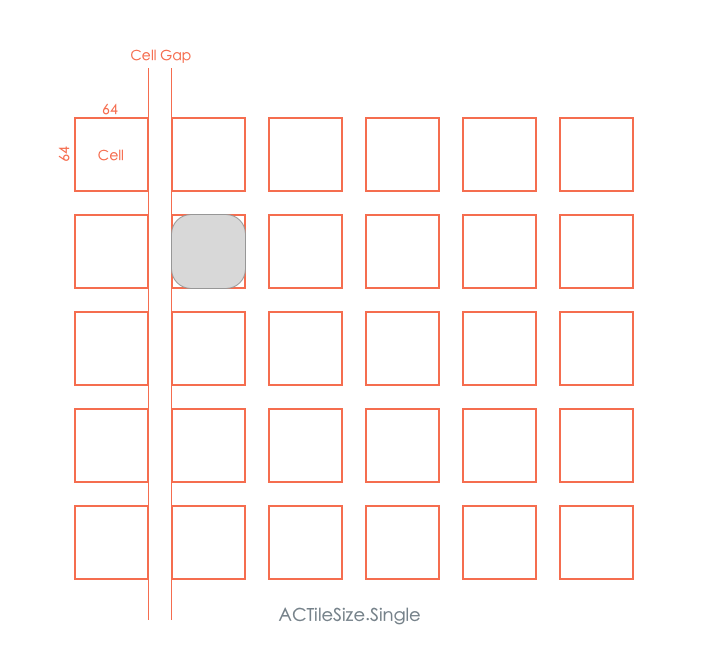 cellGap – The space between the cells. groupGap – The space between the groups. background – The Tile Controller’s background color. backgroundImage – The optional Tile Controller background image. border – The Tile Controller’s border color. indentTop – The top indention. indentBottom – The bottom indention. indentLeft – The left indention. indentRight – The right indention. 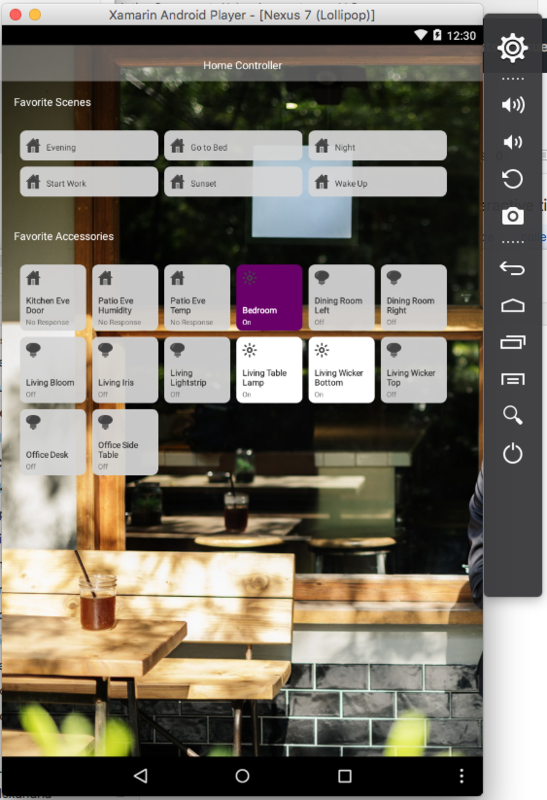 Horizontal – The Group/Tile collection will be laid out top to bottom and scroll left and right. 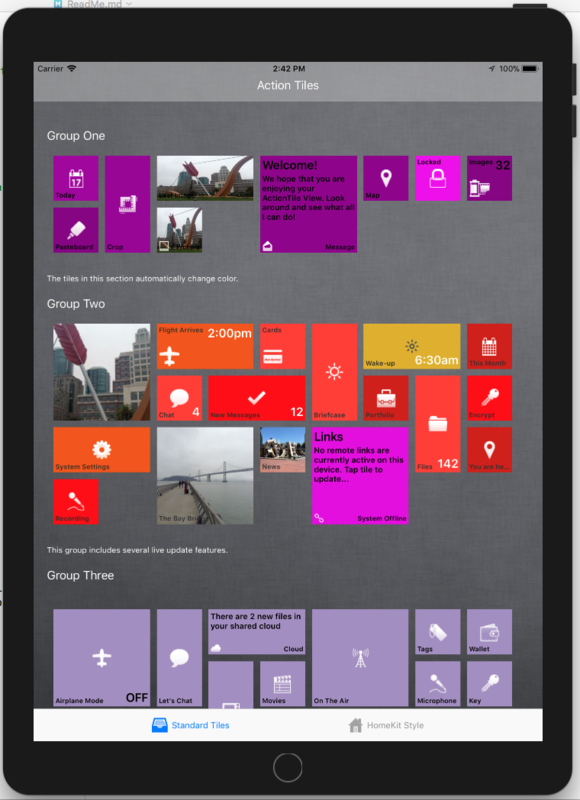 Vertical – The Group/Tile collection will be laid out left to right and scroll up and down. defaultTileAppearance – The default appearance for all Tiles in the Group. groupType – The type of the Group. shrinkTilesToFit – If true larger tiles will be shrunk to the Single tile size to fit the next available space when laying out Tiles. autoFitTiles – If true Tiles will be shuffled to fit the next available space regardless of their actual order. controller – The parent Tile Controller. appearance – The appearance of the Tile Group. columnConstraint – Constrains the number of columns in the Group. rowConstraint – Constrains the number of rows in the Group. title – The optional Group title. footer – The optional Group footer. count – The number of Tiles in the group. hasBackground – If true the Group displays a background, else it is clear. hasShadow – If true the Group has a shadow. background – The Group’s background color. border – The Group’s border color. borderWidth – The Group’s border width. borderRadius – The radius of the Group’s corners. roundTopLeftCorner – Rounds the Group’s top left corner. roundTopRightCorner – Rounds the Group’s top right corner. roundBottomLeftCorner – Rounds the Group’s bottom left corner. roundBottomRightCorner – Rounds the Group’s bottom right corner. shadow – The Group’s shadow color. titleColor – The title color. footerColor – The footer color. footerSize – The footer font size. constraintType – Sets the type of constraint to apply. maximum – Sets the maximum number of rows or columns. Flexible – Calculated from the number of rows or columns that have been specified. Fixed – A set number of rows or columns. FitParent – Fills the parent ACTileController based on the given indent padding values. 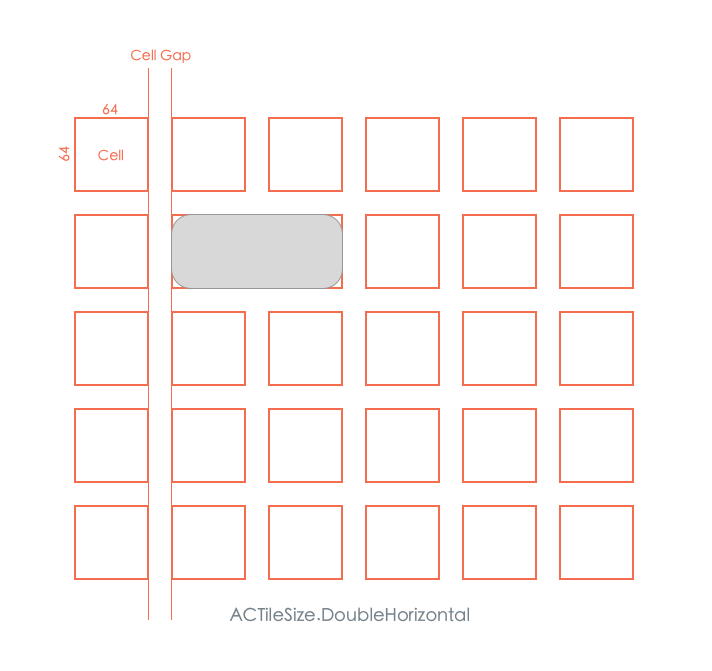 ExpandingGroup – For Horizontal ACTileControllerScrollDirection the ACTileGroup will fill the parent ACTileController vertically and grow in width based on the number of ACTiles it contains. For Vertical this is inverted, it will fill the parent ACTileController horizontally and grow vertically. PageGroup – The ACTileGroup will be one “page” wide and high, filling the parent ACTileController both horizontally and vertically. FixedSizePageGroup – For Horizontal ACTileControllerScrollDirection the ACTileGroup will fill the parent ACTileController horizontally and have a fixed height based on the given number of rows. For Vertical this is inverted, it will fill the parent ACTileController vertically and have a fixed width based on the given number of columns. leftButtons – The collection of buttons displayed on the left side of the bar. rightButtons – The collection of buttons displayed on the right side of the bar. appearance – The bar’s appearance. title – The bar’s title. hidden – true if the Navigation Bar is hidden. The default is for the Navigation Bar to be hidden. background – The default background color. darkBackground – The darkened background color. autoDarkenBackground – If true, the Navigation Bar will automatically switch to the darkBackground when a Tile Group scrolls under it and return to the background color when it scrolls out. titleColor – The color of the title. barHeight – The height of the Navigation Bar. topPadding – The optional padding to add to the top of the bar. Default – A ACTile with a large central icon and optional title on the bottom. DescriptionBlock – A ACTile with a central block of text, and optional title and an optional title image. CornerIcon – A ACTile with an icon 32 x 32 pixel icon in the lower left hand corner and an optional title. TopTitle – A ACTile with a large central icon and optional title on the top line. BigPicture – A ACTile with a large image and optional title on the bottom. Scene – A ACTile with a large image and optional title. This style works best with a ACTileSize of DoubleHorizontal or greater. Accessory – A ACTile with a large image in the upper left hand corner and optional title and subtitle at the bottom. This style works best with a ACTileSize of Quad. 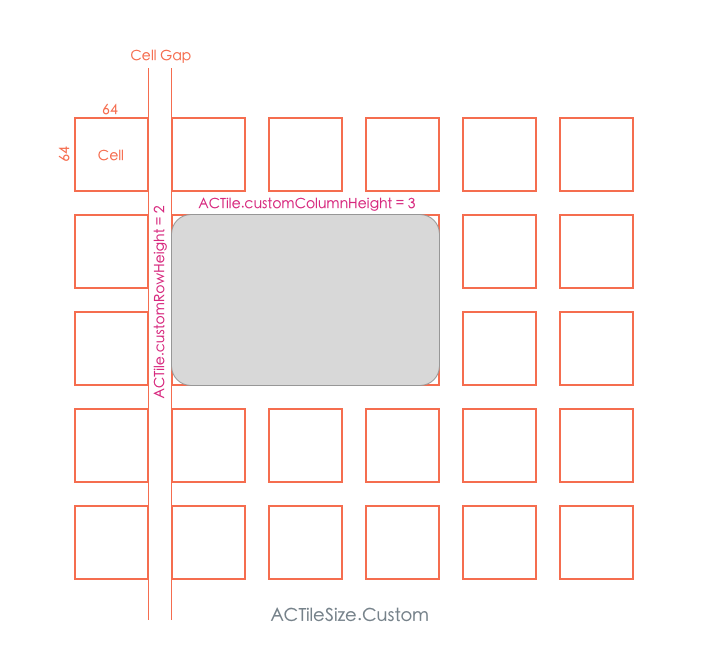 CustomDraw – Allows the developer to custom draw the ACTile. background – Sets the starting background color. minimum – Gets or sets the minimum hue variance. maximum – Gets or sets the maximum hue variance. colors – An array of colors to pick from. Mutates the color of the given ACTile attached to this ACTileLiveUpdate with in the given brightness range for the given base color. filenames (iOS ONLY) – A list of filenames for the images to cycle through. images – A collection of images to cycle through. NOTE: On iOS, the developer can provide either a list of filenames or a collection of images, but should not provide both. liveUpdateActions – A collection of liveUpdates to run against the tile. titles – A collection of titles to cycle through. subtitles – A collection of subtitles to cycle through. descriptions – A collection of descriptions to cycle through. NOTE: The developer should provide an equal number of titles, subtitles and descriptions. The Trial version of Action Tiles is fully functional but includes a Toast style popup. The fully licensed version removes this popup.